I am stoked to be able to bring you the latest instalment in our interview series with local authors. This week I had the privilege to chat to rising star DK Mok. Mok has already made a big impression with her work so far, and her upcoming release Hunt for Valamon has the speculative fiction community buzzing with excitement! I was able to chat to her about various things, including her upcoming release and her love for Roald Dahl! DK Mok, welcome to Smash Dragons. Thanks! I’ve been enjoying your current interview series with Australian authors, so it’s a pleasure to be here. First up, tell us a bit about yourself and your upcoming release Hunt for Valamon. I’m a fantasy and science fiction author with a degree in Psychology and a passion for science, adventure stories and geek culture. My debut novel, The Other Tree, was published by Spence City last year, and my second novel, Hunt for Valamon, is being released on the 7th April 2015. Hunt for Valamon is an epic fantasy adventure about a vanished prince, a dangerous curse, and the cleric who’s determined to uncover the truth. In a nutshell, when Prince Valamon is mysteriously abducted, reclusive healer Seris must leave behind the sanctuary of his book-infested temple, venture into the wild, unconquered lands, and find the missing prince before tensions in the empire erupt into war. Why did you become a writer? Was it something you worked towards or just kind of fell into? As a kid, I spent a lot of time in libraries, and for me they were a magical place full of fantastic adventures, strange worlds and powerful lessons. Books transported me and transformed me: they could entertain me for an afternoon, comfort me through difficult times, or profoundly change the way I saw the world. Early on, I knew that this was what I wanted to do with my life. I wanted to bring people the same wonder, excitement and intrigue that my favourite authors had brought to me. Throughout my school years, I was always writing: mostly short stories, vignettes, and at one point, epic space opera serials. I had to take a break from writing while I was earning my Psychology degree, but once I graduated, I began to focus more seriously on my writing. While I loved psychology and science, I knew in my heart that I wanted to be a fiction writer and that if I never gave myself the chance to chase that dream, I’d always regret it. So, I worked an office job during the day, and wrote novels and short stories after work, on weekends, and whenever I had a spare moment. Some of my short stories started getting published in anthologies, and last year, Spence City published The Other Tree. It’s been a long road, but there’s nothing else I’d rather be doing. Your upcoming release Hunt for Valamon is generating lots of excitement in the speculative fiction community. What challenges did you face in writing and getting it published? Hunt for Valamon is more complex than anything I’d written before. It’s set in a sprawling fantasy world, with intertwining plot threads, and a large cast of characters driven by conflicting motivations. It was a challenge trying to get the story and character arcs to hit all the right marks at the right times, but it was immensely satisfying to see it coming together. I was actually quite fortunate that Spence City signed Hunt for Valamon not long after signing The Other Tree. Some publishers prefer authors not to genre-hop, but my editor was incredibly supportive of my propensity to leap from rogue botanists to vanished princes. Tell me about the world in Hunt for Valamon. Is it primarily medieval, or can we expect some curveballs in terms of design? I have a strong affection for the classic sword and sorcery worlds, having grown up playing Dungeons & Dragons and soaking up the Dragonlance series. However, one of the joys of fantasy, and speculative fiction in general, is that you can tweak conventions, sidestep reality and play with expectations. The world in Hunt for Valamon is medieval in the sense that the society is largely feudal with pre-industrial technology, but the population is slightly more socially progressive and culturally diverse. I love aspirational universes, like the one in Star Trek: The Next Generation, so while the world in Hunt for Valamon is still troubled by violence, plague and politics, it does have very literate peasants and a modest level of hygiene. I’ve always loved fantasy, and I’ve thrown an icosahedron or two in my time. I grew up playing games like Quest for Glory and Might & Magic, storming catacombs and slaying skeletal warriors. I always played fighters, archers, thieves or mages – all the better for storming or slaying – but over time, I became more interested in the healers, the clerics, the peacemakers and diplomats. In real life, many of my heroes are doctors and aid workers. People like obstetrician Catherine Hamlin and ophthalmologist Fred Hollows. I admire their courage, ingenuity, passion and dedication. As time went on, I found myself wanting more and more to write a fantasy adventure featuring a healer as the protagonist. I still wanted sinister dungeons, deadly enemies, and maybe some explosions, but I was curious to see how a healer would deal with these obstacles, especially someone with a deep commitment to do no harm. The result was Hunt for Valamon. The protagonist, Seris, is a bookish healer tasked with finding the missing prince. Unable to rely on combat prowess, stealth or charisma, he has to be clever, resourceful, persistent and creative. I get the feeling from the blurb that magic is going to be a key part of Hunt for Valamon. Can we expect a fully-fledged magical system to be a part of the world or will magic be a more mysterious player in the story? I’m a great admirer of fascinating magic systems, like the one in Mitchell Hogan’s Sorcery Ascendant Sequence, but magic has a more shadowy presence in Hunt for Valamon. While sorcery plays a key role in this story, it doesn’t take centre stage so much as it haunts the rigging. In Hunt for Valamon, sorcery is forbidden and has largely disappeared from the known world. So, Seris doesn’t use sorcery, not really. He uses deity-assisted enhanced healing techniques, which is mostly exempt from penalties involving dismemberment. Even so, sorcery bubbles in the background and slithers in the shadows, because this story is partly about what happens when you try to stamp out what you don’t understand. 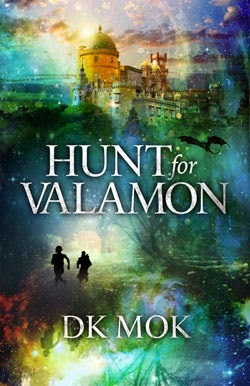 The cover art for Hunt for Valamon looks amazing! Did you have much input in its design? Are you an architect or gardener when it comes to writing? How does a day of writing usually unfold for you? I’m definitely an architect. I love interwoven story threads, dramatic character arcs, foreshadowing and circularity. I’m in awe of writers who can do all that on the fly, but I need my pages of notes and spreadsheets. There’s still room for the story to grow and shift organically, but I like to have a clear idea of how the story’s going to end. I write mostly in the evenings after work, and as much as I can on the weekends. I carry a notebook wherever I go so I’m always jotting down ideas when I get a spare moment. This isn’t your first foray into publishing. Tell me about your previous book The Other Tree. How is it different to Hunt for Valamon? 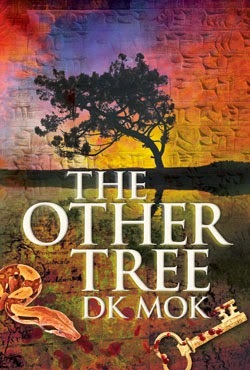 The Other Tree is an urban fantasy novel about an outcast botanist searching for the legendary Tree of Life and a cure for her ailing father. It’s more of an adventure romp, with dashes of natural history, paleontology, hijinks and geek culture. It was heavily influenced by the researchers I admired growing up: people like zoologist David Attenborough and primatologist Jane Goodall. The Other Tree also gives a cheerful nod to the Indiana Jones movies, which first sparked my interest in tales of academics having fantastic adventures. While Hunt for Valamon is high fantasy, The Other Tree is set in a fairly contemporary world, with modern problems and current social politics. The themes in The Other Tree are also more personal and less epic, revolving around issues of family, mortality, ambition and priorities. I have read that you’re a massive fan of Roald Dahl (me too!). What was it about Dahl that helped shape who you have become as a writer? Who else would you rank as influential to your craft? It’s always great to meet another Roald Dahl fan! Growing up, I was constantly reading and re-reading his books. I admired inquisitive Sophie in The BFG, I was fascinated by the giant bugs in James and the Giant Peach, and after reading Matilda, I spent months trying to develop telekinesis. No luck. I loved Dahl’s books for their brave, clever and kind child protagonists and their wondrous, imaginative adventures. However, I think what influenced me the most was the wicked humour and the touches of the absurd. I’ve always been drawn to stories that are a little quirky, a little oddball. The stories that retain a sense of fun or dry wit even though, at times, they might venture into darker territory. Later on, I became a huge fan of Terry Pratchett’s work for the same reason. His stories are brilliantly imaginative, deeply intelligent, socially incisive, and extremely funny. It’s something that has come to shape my own writing – the touches of quirk and the appreciation of the absurd. I believe that humour is an essential part of the human experience, whether it’s sly wit, gallows humour or random oddness. And it was authors like Roald Dahl and Terry Pratchett who first fuelled my love of fun, fantastic adventures. What is it about fantasy fiction that is so appealing in your opinion? For me, it’s the sense of awe and wonder these stories can evoke, the sense of stepping beyond the confines of reality. In fantasy, and other speculative fiction, you can explore any concept, any theory, any society, any world. You can hold up a mirror to your own life, or plunge through the looking glass into alien realms. Fantasy can be a wonderful form of escapism, but equally powerful is what you bring back with you when you return to reality. When you emerge from the pages, those concepts and worlds sometimes cling to you, they’ve infused and changed you. Whether it’s a greater appreciation for the plight of elderly swamp dragons, or a deeper understanding of the value of diversity, you bring some trace of those stories back into reality, tracking it in like mud or dandelion seeds, and in doing so, you subtly change the world around you. I love the sound of magpies warbling. It has the loveliest musical quality. What is your take on the speculative fiction scene here in Australia? Do you think it is going from strength to strength at the moment? I’ve found the speculative fiction scene in Australia to be wonderfully vibrant, innovative, active and welcoming. It’s exciting to see all the imprints, small presses, writers, anthologies, awards, podcasts and blogs that champion speculative fiction in its various forms. Just to name a few, there are publishers like FableCroft Publishing, Twelfth Planet Press and Ticonderoga Publications; podcasts like Galactic Suburbia and Galactic Chat; and blogs like Ebon Shores, Stephanie Gunn, and your own Smash Dragons. If you could be one superhero for a day who would it be and why? For powers alone, I’d probably be Blink from the Marvel Universe. Of all the superpowers, teleportation is the one I covet most. I’d visit all the places on my bucket list, and if I was feeling particularly anarchic, I might sneak a peek inside the secret chambers of the Great Pyramid. Best and worst writing habits? My best habit would probably be making time to write and setting a schedule. My worst habit would probably be my tendency to lose track of time when I’m writing. I need to set reminders to get up and stretch my legs, because sitting for extended periods is pretty rough on your health. What is your take on book piracy? Some authors argue it is a positive thing, and others disagree. Where do you stand? I think your recent post on the topic summed things up very thoughtfully (http://smashdragons.blogspot.com.au/2015/02/book-piracy.html). I appreciate that different authors have different opinions, and not all authors are affected in the same way. However, as I get to know more authors personally, it’s hard not to see the actual impact it has on some people’s ability to make a living and continue writing. 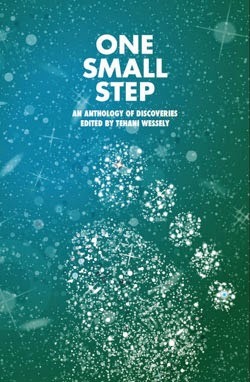 Your short story ‘Morning Star’ (in the One Small Step Anthology) was shortlisted for an Aurealis Award last year. How did you react upon receiving the news? I think I was in a bit of a daze. A delighted, stunned, excited daze. I’d only had a few short stories published at that stage, so to see my name on the shortlist alongside authors like Joanne Anderton, Juliet Marillier and Kim Wilkins was just incredible. What can we expect from DK Mok in the coming years? Any more work in the pipeline? I have a cyberpunk noir novel in the works, channelling my Raymond Chandler years, but I’ll have to see how things go. After that, I have a fantasy trilogy on the boil, and I’m scheming quietly on a standalone science fiction book after that. Best tip for aspiring writers? Of the advice I’ve received, these are the pieces that have stood me in good stead. Read widely, write a lot, work on your craft, connect with like-minded people, always be professional, be persistent, keep writing, and do what you love. Can fans expect to see you at any events or conventions this year? We do love to get our books signed! I’m looking forward to the NSW Speculative Fiction Festival in July, and I’m hoping to make it to GenreCon in October. If you’re in the area, it’d be great to say hello! Finally, give us a quick reason as to why we should immediately go out and buy Hunt for Valamon. Either way, if you enjoy fantasy adventures with mystery, humour and heart, then you might enjoy Hunt for Valamon. DK Mok, thank you for taking the time to talk to Smash Dragons! Thanks for having me on your blog, Matthew! Hunt for Valamon is out soon... I can't implore enough how cool it is so far (I am about halfway through it) and that we all need to get behind local writers! So go and get yourself a copy as soon as possible! She is an incredibly friendly and lovely person, and very interesting to chat to. So befriend and support peeps! Stay tuned for my review of Michael Moorcock's My Experiences in the Third World War and Daniel Polansky's Those Above. They will be uploaded tomorrow and Sunday respectively. Freakin' awesome. I'm starting Hunt for Valamon today and I'm very excited about it! 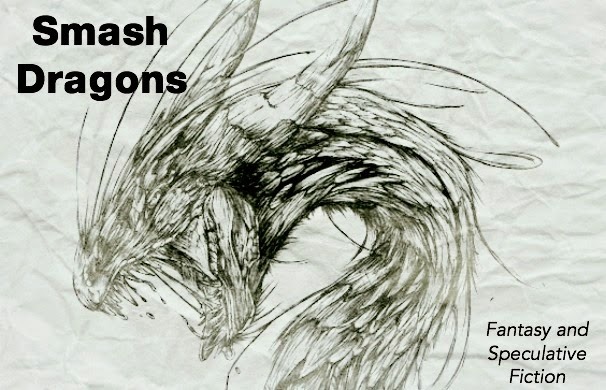 Welcome to Smash Dragons, a book blog dedicated to Fantasy and Speculative Fiction! I'm Matthew, the esteemed (well, not really!) owner of this blog. I'm a father to my beautiful daughter, and a husband to my wonderful wife! I love all things fantasy, horror, and speculative fiction. I hope you enjoy your visit! I know the reviews for this book have been mixed, but I have to say that I really enjoyed it. I dug the lovecraftian tones, and I felt comfortable with how the story played out. All in all a great read. 4 out 5.